Electricity is so essential that its absence for few minutes makes the life very diffcult. In fact it puts most of the modern household or office appliances to a total stop. Electric energy is the most versatile form of energy.We can use electric energy from a wall socket, a battery or from a isolated Diesel Generator. Here we will mainly concentrate on the first one, the electricity from the wall socket. Which is from the utility company that is part of the Grid. Electrical Power System may be broadly categorized into four types of activities. Electricity Generation, Transmission, Distribution and Utilization. In the following figure the working of different elements of a simple system is clearly illustrated . The Power Station is having a Generator also called turbo alternator. The alternator is producing electricity at a voltage level of around 12 or 15 kiloVolts (kV). The alternator is usually rated below 22 kV, as higher voltage rating will make insulation requirement prohibitive and uneconomical. The problem is that long distance transmission of bulk power at this voltage level is not possible. 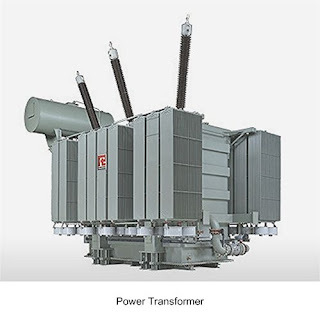 So the step up transformer is used to boost the voltage level to 220 kV or 400 kV level. The voltage at 220 kV and above are called transmission voltage levels. These days 765 kV voltage is increasingly used for very long distance bulk power transmission. Sometimes power is transmitted at 132 kV for short distances . This is called sub-transmission level. As the power arrives at the substation near a load center (may be a town) it is again stepped down to 11 or 33 kV level by step down transformer. This is the High voltage distribution level. Now the primary distribution network at 11 or 33 kV level (as required) is used as backbone for supply of power to different area substations. These area substations that again step down the power to usable voltage, 415 volts by distribution transformers. The household consumers are usually supplied with single phase connection at 240 Volts. Some Institutes, Banks, Hospitals, Small Industries etc are supplied with three phase connection. In an electrical power system, electric transmission and high voltage distribution are usually done by three phase system. Here instead of three lines for three phases we have shown only Single Line and used standard symbols. Hence this diagram is called Single Line Diagram or SLD. 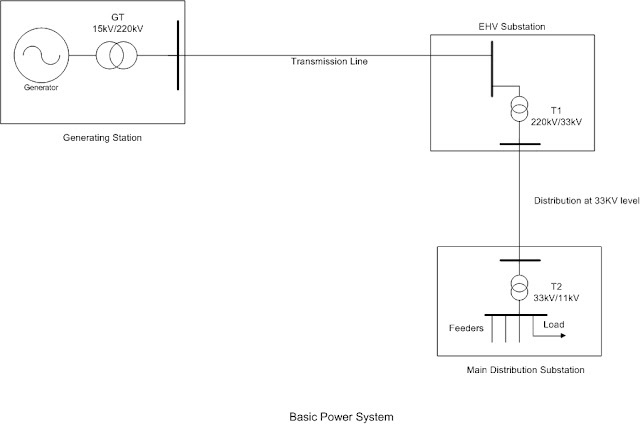 The single line diagrams are invariably used for analysis of power systems. The diagram shown above is very simple and serves our purpose for understanding basic concept. But it is far from actual modern power system. In a modern power system hundreds or thousands of generators inject power to a network at different points. The network itself is comprised of hundreds or thousands of interconnected transmission lines. We will discuss more about this in future post. This blog ended my search of basic fundamentals of Electricity transmission.